A young man’s life changes when he meets a woman through a telephone dating service. Frankie Barnes has no idea that his late-night decision to call a dating service while feeling lonely in his New York apartment will change his life forever. A frustrated salesman in his 20s, Frankie yearns for female company but suffers from unrealistically high standards and the repercussions of what he views as a traumatic experience years before with a previous girlfriend, who has now taken a restraining order out against him. When he first meets Sandy, a young mother who comes over to his condo looking for companionship, he is less than taken by her, but he soon discovers they share a real bond. Despite Frankie’s fear of possibly being HIV-positive, they have an intense sexual encounter after Sandy decides to introduce her young son—also named Frankie—to Frankie as though he is her son’s long-absent father. The whirlwind relationship escalates quickly into a frightening episode featuring Frankie’s ex-girlfriend and a trip to Florida to visit his ailing mother, who is suspicious about little Frankie’s true parentage. According to his preface, Duffy (Stockboy, 2013) drew on his own life to write the novel, but the telling is short on the authenticity of lived experience. Though readers are supposed to feel sympathy for Frankie, it is difficult not to see him as a frustratingly selfish man: His behavior toward women is immature and entitled, as with his ex-girlfriend, who he feels has wronged him simply because she broke up with him when she felt he was moving too fast. He also treats Sandy poorly as he chases after another woman who he thinks might be a better catch. His persistent refusal to get an HIV test is similarly frustrating. 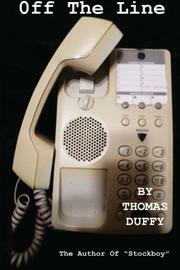 Mostly, however, Duffy’s novel suffers from being poorly written: “Frankie didn't want to let her know he was not attracted to her so he suggested he wasn't ready for anything serious although on the phone, he may have hinted he was looking for something quite substantial with a woman through his personal ad.” The plot goes in one direction and then another in ways that seem rather illogical, including a police investigation, a mob subplot and Frankie reconnecting with an old flame just as he and Sandy fly to Florida to see his mother. Throughout, the characters are written with so little psychological depth and described in such flat sentences that it is difficult to believe they could be real people. A poorly written tale of lost souls finding love.